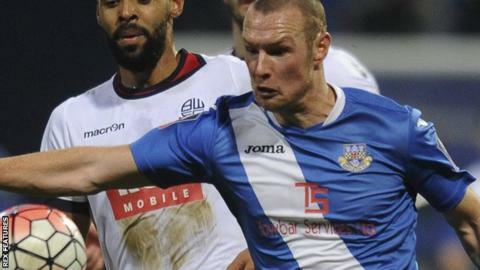 Eastleigh striker James Constable will miss the rest of the season after having his appendix removed. The 31-year-old former Oxford United forward has scored 15 goals to help the Spitfires to within a point of the National League play-off places. "It's sad news for James as he's a great lad and a great player for us," Eastleigh manager Chris Todd said. Todd's side travel to Halifax on Tuesday knowing a win will lift them into the division's top five. "It would be nice to get James Constable promoted into the Football League," Todd told BBC Radio Solent. "I'm sure he's probably sitting at home wishing he was with us as that's the kind of player he is. "These things happen and you can't control the uncontrollables, but it gives someone else an opportunity."